My son will be turning 18 in March, he's graduating high school in May, and will go on to college. He's a great boy, and I was thinking about what I could get him as a birthday/graduation present. He's never been a gun nut like I am, but he does very much enjoy the historical aspects of firearms, preferring classic guns to modern ones. He's kind of an old soul, if you will. He really likes revolvers and lever action rifles. We went to a local gun store and rented a few pistols and a revolver, and his face just lit up when shooting the S&W 686, especially single-action. He's also a big fan of the stainless steel look, over blued finish. So I thought I'd do some research on a potential gift. Of course, we'd keep them at my house until he's old enough and on his own. One gun as a present would be great, but then I was thinking a "matching set" of a lever action rifle and a revolver would just be awesome. Either both in 22LR or both in 357Mag (of course being able to shoot 38Spl most of the time). He's almost 18, and while I do think a 22 is a great first gun, he doesn't currently shoot very much and I know he really liked the extra power of the 38Spl. I've researched Winchester, Marlin, and Henry lever action rifles and looked at a few in the store. 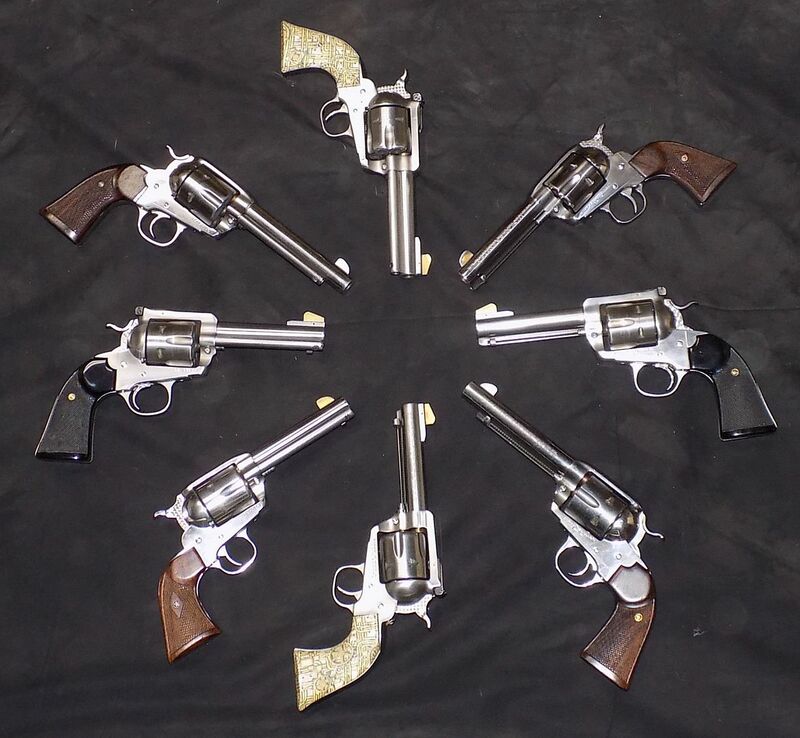 To me, it appears that the Henry Golden Boy Silver in 22LR or the Big Boy Silver in 357Mag would be my top choices. They have smooth actions and look amazing, especially with their octagon barrels. As far as revolvers, the Ruger Bearcat/Single-10 in 22LR both come in a nice stainless/wood finish that matches the Henry rifle so well, and the Ruger Vaquero in 357Mag does too. 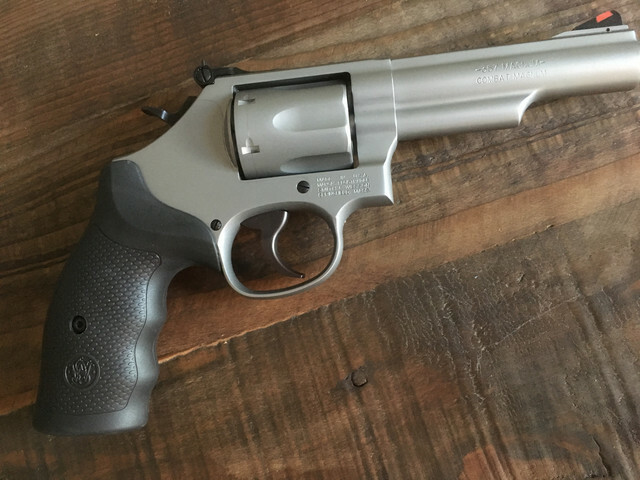 I'd also consider a Ruger GP100 in 357Mag which could give him the versatility of shooting/learning both single and double-action, and also provides an easier loading/unloading manual of arms. So... what do you guys recommend? Especially for a boy about to become a man. Any other specific models you'd suggest I consider? Buy new or used? Any places for good deals? I value your input and experience. The 22's are obviously cheaper to buy and shoot, which is a plus. I'd really like to get him something special that he will keep for a long time. A Vaquero in 38/357 would be the perfect match to a lever action rifle. OTOH: A 38/357 GP100 is a far more versatile handgun for general use. I was over 18 but not by much when I got a Blackhawk. I got over the single action pretty fast and traded it away. I still have the DA revolvers of the period. A GP100 or 686 will serve him well for the next 50 years. Henrys are pretty good guns. People grumble about their choice of slip tube loading instead of King's Improvement (loading gate) but it Just Works. Well I guess it depends on whether you want to get him something that is modern but reminiscent of historical guns, or clones of historical guns. I keep playing with the idea of a Cimarron SA Frontier (Colt SAA clone) matched with an 1873 Winchester clone. I’d do .44-40 (.44 WCF) just for history’s sake, but .357 makes more practical sense. Not saying what you’re looking at are bad options, just throwing more out there. For the long run, I would get a 38/357 combo. They offer more long term fun/recreation and can be used for ccw/home defense. Ruger has some great deals and they will last forever. I have a GP100 and my son has claimed it for when he gets older. It will sit in the safe until he is able to have it. I plan on getting some nice grips for it eventually and get a nice presentation case for it as well. He likes my Ruger 10/22 but finds the .38/357 more challenging. I prefer stainless revolvers for ease of cleaning and over all less maintenance. I wouldn't mind getting a lever action 38/357 in the future for myself. They are a blast to shoot. Don't overlook the Ruger SP101, which could also do CCW duty in a few years. If he is a novice shooter, I suggest something with adjustable sights. The Ruger Vaquero, Colt SAA and clones, may be fine guns but the fixed sights seldom shoot to point of aim. 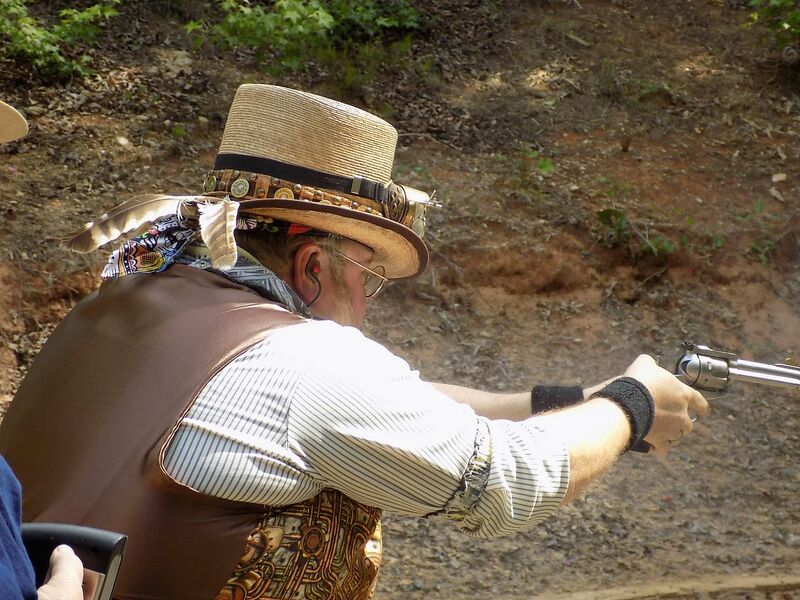 I run a 686 revolver, and a Marlin cowboy 357 , like the Marlins for quicker, easier reloading. Mine is a early JM, but they are making 357's again since there is decent demand. Id say you will get better finish and customer support from Henry, if you don't mind the tube loading . Yes, it would be cool to get a revolver and lever-action, both stainless, both in .357 Mag. The revolver is not so tough. The lever-action rifle is another matter, I believe. some of the .357 rifles bobble .38s when shooting fast. Lots of people, although I'm not one of them, don't like the Henry loading tube. I think I would recommend a SS Marlin in .357, and a new Vaquero in the same. I would highly recommend the Henry. It is so nice, smooth and the fit/finish is outstanding. It's too bad they don't make the All weather in a shorter bbl, but if they ever do, I'll jump on another. Unless he's really going to take to shooting or you're going to keep him supplied with centerfire ammo, get him a .22 pairing. A Ruger Single Six in a finish and barrel length of his choosing; various models available new and used at reasonable prices. I'd look for a Marlin Model 39 in good shape. Again, available for a reasonable price if you know how to shop. My favorite is a Winchester 9422, but their prices have climbed a little high. Another (besides the Henry) to consider is the Browning BL-22. A USFA revolver if you can find one at a decent price. I agree. Unless he wants to play cowboy, I'd choose something with adjustable sights. A Ruger Single Six would make a nice 22LR revolver. I haven't been impressed with the Henry rifles I've owned. I'd probably look at a Marlin lever action. He will shoot the 22s a lot more. Agree on the single Six. Hard to beat. Especially the early ones. A lot of the lever action 22s had aluminum receivers, which should be avoided. I’ve seen a lot of them in my shop that had the barrel threads or joint come loose, and were flopping around in the receiver. Totally rules out the use of a scope and ruins the value. This set will hopefully be passed to your grandson one day. Choose quality. For .22's, I'd go with a Ruger Single Six and either a Marlin 39a or a Henry. 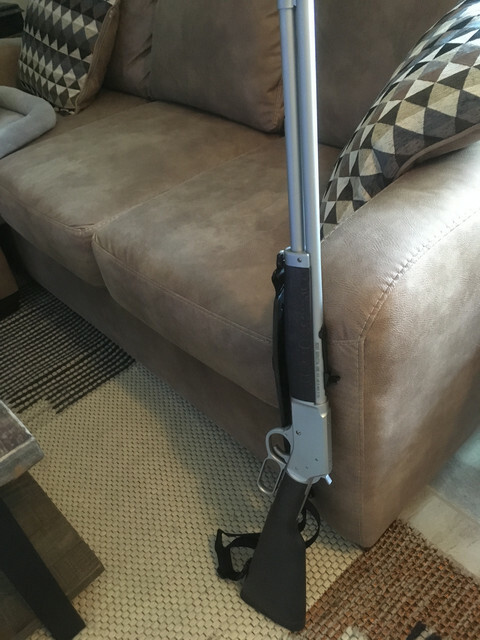 I personally like Henry rifles in .22, but not in Centerfire due to their lack of a loading gate. For Centerfire, I'd go for a Ruger Vaquero and a Uberti 1873 or a Marlin 1894. This may depart a little bit from the rest of the thread, but I would suggest a "matched pair" or either a 4" or 6" 686+ and a 617. The 686+ is an excellent "all around" gun: it can be loaded hot for SD, it can be loaded down for target shooting, can be used for CCW (obviously not a first choice, but very possible) and can be used for hunting in the 6" configuration. Holiday and birthday presents become easy: reloading supplies, a quality holster for each of those uses.. If he already likes it, that's a mark in its favor. Likewise, the 617 is a handy trainer and can be used for small game, very similar handling and weight/feel. When I went off to school, I found that I had little time and even less money to shoot with; I spent an enormous amount of time with a rented 22/45 and bricks of (then cheap) .22 even though I owned a quality 1911 (a gift much like the one you're planning on). I liked that the two guns had a similar feel, and imagine that between the two guns you would have a very excellent range covered over your son's lifetime and likely for his children's lifetime as well. I agree. Unless he wants to play cowboy, I'd choose something with adjustable sights. Just as an aside, Jaybirdaccountant, you can shoot Cowboy action with an adjustable site revolver. I do and so does Bisleyblackhawk. Ruger New Model Blackhawk Convertible .357/9mm in Stainless. Go to Ruger website to find a dealer. Your choice of lever action in .357. Perhaps Rolan will chime back in with his recommendation. I would not fault you for going the GP100 route either.